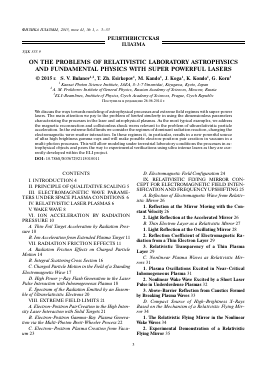 ON THE PROBLEMS OF RELATIVISTIC LABORATORY ASTROPHYSICS AND FUNDAMENTAL PHYSICS WITH SUPER POWERFUL LASERS - тема научной статьи по физике из журнала "Физика плазмы"
Поступила в редакцию 26.06.2014 г. We discuss the ways towards modeling of astrophysical processes and extreme field regimes with super-power lasers. The main attention we pay to the problem of limited similarity in using the dimensionless parameters characterizing the processes in the laser and astrophysical plasmas. As the most typical examples, we address the magnetic reconnection and collisionless shock waves relevant to the problem of ultrarelativistic particle acceleration. In the extreme field limits we consider the regimes of dominant radiation reaction, changing the electromagnetic wave-matter interaction. In these regimes it, in particular, results in a new powerful source of ultra high brightness gamma-rays and will make possible electron-positron pair creation in vacuum in a multi-photon processes. This will allow modeling under terrestrial laboratory conditions the processes in as-trophysical objects and paves the way to experimental verifications using ultra intense lasers as they are currently developed within the ELI project. electromagnetic field intensity well above 1018 W/cm2 and in the nearest future their radiation may reach intensities of 1024 W/cm2 and higher . An electron quiver energy in such fields is well above its rest mass energy. The laser matter interaction in this limit should be described within the framework of the electrodynamics of continuous media in the relativistic regime . Since matter irradiated by ultrastrong electromagnetic waves (EMW) is ionized during a time interval comparable with the wave period and becomes a plasma [3, 4] and under astrophysical conditions approximately 95% of barionic part of matter (it comprises 4.5 ± 0. 15 % of the matter in the Universe) is in the plasma state, laboratory astrophysics becomes one of the important motivations for the construction of the ultra-high power lasers [5—7], let alone the importance of studies of astronomy, and fundamental research in general [8, 9]. Nowadays there is a demand to understand the cooperative behaviour of relativistic quantum systems and to probe the quantum vacuum. It was realized that the vacuum probing becomes possible by using high power lasers . With the laser intensity increasing, we shall encounter novel physical processes such as the radiation reaction dominated regimes and then quantum electrodynamics (QED) processes. Near the intensity corresponding to the quantum electrodynamics critical electric field, light generates electron-positron pairs from vacuum and the vacuum begins to act nonlinearly. erates shock waves; the converging gas motion is accompanied by the Rayleigh—Taylor and Richtmayer-Meshkov instability development; collimated plasma jets are formed; the matter equation of state acquires new properties under extreme pressure, density and temperature conditions, which of paramaunt importance for the high energy density state of matter physics. In the limit of relativistically intense field the laser plasma emits high energy charged particle beams and high- and low-frequency powerful electromagnetic radiation. Gathering of these facts principal for both space and laboratory physics has initiated works in the so-called laboratory astrophysics [5, 6] with the aim to model the processes of key importance for the space objects under laboratory conditions. We note that the research on the laboratory astrophysics is in the plans of almost all over the world leading groups working on the develepment and applications of the high power laser facilities [1, 10]. These facts has also attracted a lot of attention regarding the studies of the fundamental physics problems with ultra high power lasers [11, 12]. Future exawatt scale facilities, e.g. as ELI (Extreme Light Infrastructure, ), are intended for fundamental science, including high field science. In the plans of all these facilities there are experiments for laboratory astrophysics. In the project of ELI, designed for producing femtosecond pulses, laboratory astrophysics is one of the main motivations. In contemporary relativistic astrophysics, central are the questions on the mechanisms of charged particle acceleration . In space plasmas basic mechanisms of cosmic ray acceleration are the reconnection of magnetic field lines, which is accompanied by the strong and regular electric field generation (it occurs in the planet magnetosheres, in binary stellar systems, in accretion disks, in the magnetar magnetospheres, etc.) and with collisionless shock waves, at the fronts of which the charged particle acceleration occurs (this happens in interplanetary space, during supernova explosions, in colliding galaxies, etc.) [15-17]. In the laser plasmas, wakefield accelerators,  and , presently provide the most advanced schemes for electron acceleration. Similar mechanisms may be suggested to be good candidates for the charged particle acceleration in space [20-24]. One of the efficient mechanisms of ion acceleration in laser plasmas utilizes the radiation pressure of electromagnetic waves interacting with plasmas . Radiation pressure is a very effective mechanism of momentum transfer to charged particles. This mechanism was introduced long ago [26, 27] and physical conditions of interest range from stellar structures and radiation generated winds (see e.g. Refs. [28-30]), to the formation of "photon bubbles" in very hot stars and accretion disks [31, 32], to particle acceleration in the laboratory [25, 33-39], see in addition Refs. [40, 41], and in high energy astrophysical environments [42, 43]. SATUNIN P. — 2015 г.
МОРОЗОВА А.Ю., САВЧЕНКО В.В. — 2012 г.
KALASHEV O., SEMIKOZ D., TKACHEV I. — 2015 г.
ЛЫСЕНКО К.О., МОРОЗОВА А.Ю. — 2012 г.